I really like the way grammar is handled in TPR. Pop-up grammar (PUG) questions are timely, relevant, contextual and flexible. They’re a great way to help students conceptualize grammar, and with a little creativity, they set a strong foundation for independent accuracy in usage. Masculine and feminine. In French, nouns and their modifiers are essentially feminine or not. There are no masculine markers. There are forms, and then there are feminine-marked forms. Verb endings. 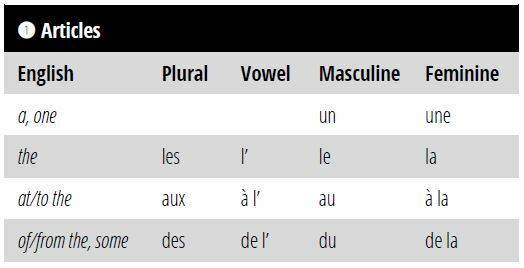 Verbs are conjugated by six distinct persons in theory, but in general, there are only three or four vocalizations: nous, vous, sometimes ils, and then everybody else. Three verb conjugations. Even French people have abandoned the Latin-based concept of -er, -ir and -re verbs. There are two types of regular verbs in French: those that take -er verbs, and the rest. I teach students one song that gives all the endings for regular verbs, including “rules” for special cases like dormir. Their TPR/TPRS experience guides them in applying the lyrics. We use terms like “girl-e”, “natural-e” and “I-and-he/she-e” to talk about confusing similarities (In this case, the common French ending -e). We have catchphrases for weird rules like alternation of -s and -x in certain forms (U/SE-X) and changing indefinite and partitive articles after pas (Pa ain’t got no undies). Little tricks like these are great on the fly, and I’ve found that students can fix the vast majority of their mistakes with their songs and catchphrases alone. But what happens when students want to become even more independent? What if they want to get it right the first time, guaranteed? In this case, they’re going to want some reference material, and it’s my job to make it just as creative and user-friendly as their catchphrases. Traditional paradigms and grammar presentations are created by a select few left-brainers. They often rely on linguistic concepts that may not even be relevant to the modern language. At this stage, I need two things. First, I need my own reinvention of the target grammar. Then I need to know what happens when my students look at a printed rule or chart to help me predict (and eliminate) any possible confusion. After all, my students are ready for this. They want to be empowered to use the material independently. They’ve seen all these concepts in TPR, TPRS and PUG, and now they want it all in one place. My French 1-2 Grammar Sheet contains all the grammatical information my students need to know, but organized according to our conceptualization of French grammar. Students start using it after they’ve had lots of PUG, enough so that they’re not only familiar with the concepts but also starting to recognize the terminology. After a few weeks, I introduce the sheet by giving students a chance to find the rule or form during PUG, which is easy because each has a reference number or letter. Later, when students want to check a form on their own, they know how to follow the chart like a treasure map. With noun determiners, for example, I’ve changed the traditional paradigm into an algorithm. Students find the meaning they want on the left, and then the form they need on the top, working left to right. Is the noun plural? No? Then does it start with a vowel? And so on. What I’m essentially trying to do is streamline students’ grammar-thinking process. Yes, a noun can be masculine and plural and start with a vowel all at the same time, but how much of that really matters? I hide the details that don’t matter and use only enough traditional detail to help students who might draw from additional resources or transfer in from other programs. Sometimes I include more than the traditional paradigm because I’ve seen students get confused by certain details. My students get a lot of use out of their charts, and I enjoy watching them — not because I want them to be thinking about grammar all the time, but because I know they feel confident and empowered to put that final polish on their TPR- and TPRS-based intuition. French teacher, travel enthusiast, musician, author of the Fīlum Fātī series. Perdre ce trésor du patrimoine français est inconcevable. Prions pour #NotreDame. Sometimes, especially this time of year, it's easy for us teachers to get hung up on negative hindsight. I spent way too much time looking in the rear-view mirror with dreary eyes today, so I'm ending with some positivity. My French 1 students are making mixed-tense sentences with relative clauses and object pronouns. My 7th graders just told me a story about the fish that ate Taylor Swift's guitar and went to play basketball with Stephen Curry. My French 2 kids wrote page-long essays about internet safety and tech usage on their last test. My 6th graders are making stamps for kente fabric prints. My independent Gaelic scholar can carry on conversations with initial consonant mutations and dependent verb forms and amalgamated prepositions. It's been a pretty dang good year. My students know I love a good #franglais pun. #WeChat #OuiChat. Grandparents' Day is one of my favorite traditions @thewebbschool! Nature walk. Obstacle course. Critter search. Outdoor concert. Paleography lesson. Had a blast reading "Ours brun, dis-moi..." and learning all about animals and colors in French with these cool kids for Read Across America! We have the best @sagediningservices chefs @thewebbschool ! Shout out to Miss Alexis who made our princess her very own dairy-free French toast from scratch!